This story was updated at 2:26 p.m. EST. For the very first time, a NASA spacecraft has detected matter from outside our solar system — material that came from elsewhere in the galaxy, researchers announced today (Jan. 31). This so-called interstellar material was spotted by NASA's Interstellar Boundary Explorer (IBEX), a spacecraft that is studying the edge of the solar system from its orbit about 200,000 miles (322,000 kilometers) above Earth. "This alien interstellar material is really the stuff that stars and planets and people are made of — it's really important to be measuring it," David McComas, IBEX principal investigator and assistant vice president of the Space Science and Engineering Division at Southwest Research Institute in San Antonio, said in a news briefing today from NASA Headquarters in Washington, D.C. These atoms are remnants of older stars that have ended their lives in violent explosions, called supernovas, which dispersed the elements throughout the galaxy. As interstellar wind blows these charged and neutral particles through the Milky Way, the IBEX probe is able to create a census of the elements that are present. According to the new study, the researchers found 74 oxygen atoms for every 20 neon atoms in the interstellar wind. For comparison, there are 111 oxygen atoms for every 20 neon atoms in our solar system, meaning there are more oxygen atoms in any part of the solar system than in nearby interstellar space, the scientists said in a statement. "These are important elements to know quantitatively because they are the building blocks of stars, planets, people," McComas said. "We discovered this puzzle: matter outside our solar system doesn't look like material inside our solar system. It seems to be deficient in oxygen compared to neon." The presence of less oxygen within interstellar material could indicate that the sun formed in a region with less oxygen compared to its current location, the researchers said. "That leaves us with a puzzle for now: could it be that some of that oxygen, which is so crucial for life on Earth, is locked up in the cosmic dust?" asked Eberhard Möbius, a professor at the University of New Hampshire and a visiting professor at Los Alamos National Laboratory in New Mexico. "Or, does it tell us how different our neighborhood is compared to the sun's birthplace?" The galactic wind streams toward the sun from the direction of Scorpio and IBEX has found that it travels at 52,000 miles an hour. The speed of the galactic wind and its subsequent pressure on the outside of the solar system's boundary affects the shape of the heliosphere as it travels through space. IBEX also measured the interstellar wind traveling at a slower speed and from a different direction than was previously thought. The research now shows that the interstellar wind exerts 20 percent less pressure on our heliosphere, which is a protective bubble that shields our solar system from powerful, damaging cosmic rays. "Measuring the pressure on our heliosphere from the material in the galaxy and from the magnetic fields out there will help determine the size and shape of our solar system as it travels through the galaxy," Eric Christian, IBEX mission scientist at NASA's Goddard Space Flight Center in Greenbelt, Md., said in a statement. The results of the new study will also help scientists shed light on the history of the material in the universe. "It tells us things about the part of space that we live in, and the interaction with that part of space with the rest of the galaxy," McComas said. The observations from IBEX and the ability to determine the ratio of elements in space could help scientists understand how the galaxy has evolved and changed over time. "I find it really exciting that right on our front doorstep, we can take a sample of this interstellar matter around us," Möbius said. "If you think back all the way to the Big Bang, there was only hydrogen and helium. Then stars and supernovas sprinkled it with heavy elements — if you imagine that we are made out of the material that has been belched out of the supernovas, and it is continuing. So, 4.5 billion years ago, the sun formed out of the solar nebula, and now we are sampling part of the Milky Way as it is today. It gives us nice data points — Big Bang and the sun's formation to what is our environment. Then modelers can go and trace how that material has evolved over time in the cosmos." The findings are detailed in a series of papers that were published today in the Astrophysical Journal. This NASA-provided graphic shows the heliosphere around the sun. The region is dominated by the sun and s inflated, like a bubble, in local interstellar material by the million mile-per-hour solar wind. This bubble keeps out the ionized or charged particles and magnetic fields from the galaxy and so protects us from dangerous galactic cosmic rays. 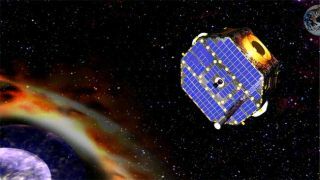 NASA launched the IBEX mission in October 2008 to map the boundary between the solar system and interstellar space. The $169 million spacecraft was originally built for a two-year mission. IBEX measures and counts particles called energetic neutral atoms, which are created in an area of our solar system known as the interstellar boundary region. Since its launch, the spacecraft has already made groundbreaking discoveries about the heliosphere and the boundary between our solar system and interstellar space. In 2009, IBEX detected a mysterious ribbon on the edge of the solar system made up of a stream of charged particles that travels a million miles per hour from the sun. In 2010, researchers announced that IBEX had witnessed the first-ever look at solar wind crashing into Earth's magnetosphere.